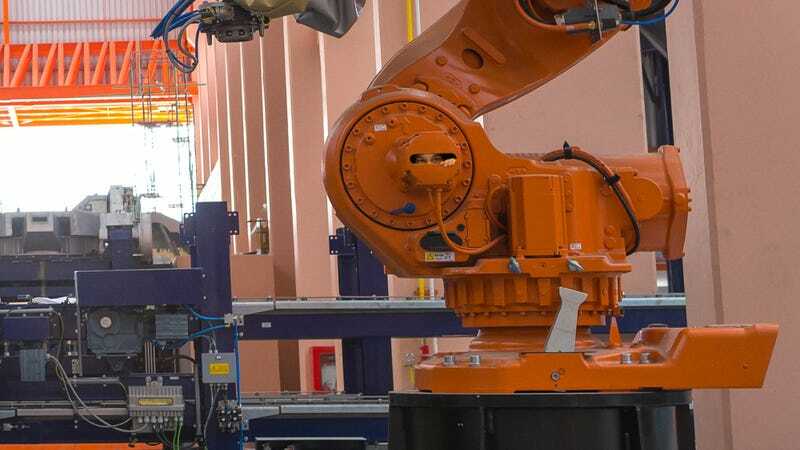 TULSA, OK—Dreading the day new technologies would emerge to render his craft obsolete, Vince Callahan, an autoworker crouched inside a robotic welding arm, told reporters Tuesday that he was terrified a robot would eventually take his job. “This is all I know how to do. If they ever make a robot that can do this job, I’m finished,” said Callahan, adding that, with 20 years of experience in the ultra-specific field and only a trade school degree, he would be unlikely to find another job in the event of being replaced by an automated machine. “Huddled here in the control center of a welding arm all day and performing the same identical task 2,000 times in a row isn’t exactly the easiest job in the world, but I’ve got a family to feed. I hope the powers that be understand that this job takes the type of heart and passion only a human can provide.” Callahan also expressed fears that robots would one day replace his wife’s job handing out soft drinks from inside a vending machine.